Use versions of the Bible thoughtfully. When someone’s been reading a version of the Bible for many years, an affinity develops, much like a long-time friendship. If you’re working one on one with a senior and s/he loves a particular version, then use that version. If you’re working with a small group of seniors it may be wise to ask, “What version of the Bible do you like reading?” If there’s consensus, use the version they want to use. Discuss pertinent topics. Seniors have interests and needs that are specific to their stage of life. They’re trying to figure out how to age gracefully, thrive in the empty nest, make retirement meaningful, enjoy the joys or cope with the trials of grand parenting, deal with health problems, face death, and look forward to Heaven. While Bible reading/reflection of the whole Bible should be encouraged, opportunities to explore texts that are relevant to seniors should also be facilitated. Listen and learn. 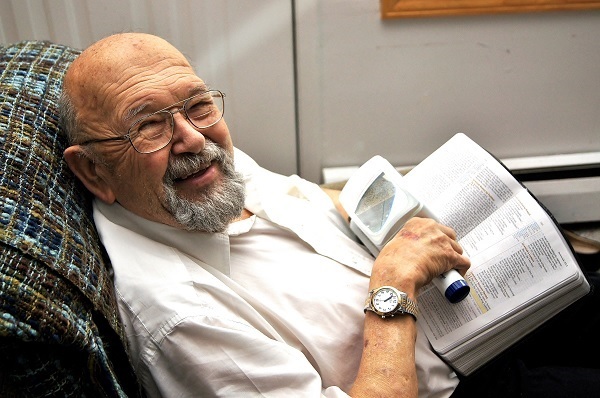 Some seniors are veteran Bible readers who have been feasting on the Bible for a lifetime. Their love for the Word, insights and understanding can help younger Christians grow in faith. Facilitate mentoring relationships and opportunities for seniors to interact with younger Christians (cf. Titus 2:3). Deal with competing priorities. Some seniors have very active lifestyles and may need help cultivating Bible engagement disciplines. Invite them to be part of a seniors Bible study group. Introduce and teach different Bible reading methodologies. Be aware of fatigue. As a person ages, they tire more easily. When attention span diminishes, times of Bible reading/reflecting may need to be shorter. Be cognisant of physical challenges. Failing eyesight can make it hard for seniors to read the Bible, and hardness of hearing can make it difficult to hear audio Bibles. Some medications have side-effects that may restrict a person’s capacity to adequately read/reflect the Bible. Use large print resources. There are large print Bibles and guides that make it easier for seniors to read/reflect on the Scriptures. Some seniors who use laptops or tablets to read the Bible may need to be shown how the font size can be enlarged. Equip seniors with tools/resources. Encourage seniors to share/give/teach the Scriptures to their children, grandchildren and others. Children aged 4-8, for example, enjoy reading Scripture Union’s Rhyming Books with their grandparents. Use specialized resources. Bible reading/reflecting curriculum has been written for people with dementia, Alzheimer’s and similar health issues, e.g., Scripture Union’s Being With God series. Be respectful. Seniors have a lifetime of experience and knowledge behind them. Maybe that’s why the Scriptures say we should, “stand up in the presence of the aged, show respect for the elderly and revere your God” Leviticus 19:32. When we help seniors get into the Word we must do it in a way that honours them for who they are. Have your say. How do you help seniors get into the Word? Categories: Encounter, Interaction | Tags: Bible engagement with seniors | Permalink.